Who the heck was Guyot? Shooting sportsman around the world know that there are a lot mysteries in the world of fine firearms, even today when the web makes information so easy to find. One of these mysteries is the gunmaker, or gunmakers, Guyot. Over the years, I’ve come across a bunch of double barrel shotguns with the name Guyot on them. They have come in a variety of grades – from field-grade boxlocks to Best-quality sidelocks. All of them appear to have been from France and they have all been very well made. This guns looks to have been made in the 1880s. With a bar-in-wood-style action and a push-forward underlever, this is an unusual hammerless gun. These features were more popular on hammerguns, like on this Purdey from Steve Barnett Fine Guns, but almost never seen on hammerless models. The gun also has Whitworth fluid compressed steel bbls and it’s a non ejector. I suggest you read the whole article and check out the pics to learn just how interesting and well made this gun is. Hey London, eat your heart out. Nice, huh? Looks at how the forend iron matches up and fits into the action. I’ve seen Purdeys that aren’t as well made. Here are more pics of this fabulous gun. As you can see, it’s a best quality – I would say on par with some of the finest guns made in the UK. It sure looks like Guyot was influenced by Purdey’s engraving pattern and overall style. 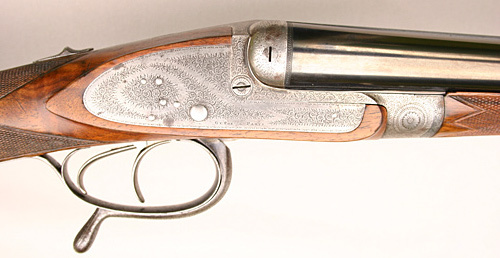 The toplever is also Purdey-esque and the gun has chopperlump Whitworth-steel bbls — like a Purdey. Notice that the hinge pin screws in from the right-hand side on this one. On the Guyot above, it comes in from the left. Why? I don’t know. Also, the screw that fastens the lock to the action is blued on this gun. On the other one it’s color-case hardened. Again, I have no idea why. As you can see, this N. Guyot boxlock is a top-quality shotgun. It features Sir Joseph Whitworth fluid-compressed steel bbls (very English), ejectors, a hinged front trigger, and it looks like it intercepting safety sears (these would keep the gun from firing if the hammers dropped without the triggers being pulled). Those dimpled pin/screw heads are real Continental, too. I like how the action is filed up on the gun, especially the shoulders/double beads on the sides. Whoever made this gun put a lot of time and work into it. Just look at the metal-to-metal fit. Very well done. And finally, here’s a pair of 16g Guyots, also courtesy of Steve Barnett Fine guns. These are sideplated boxlocks with exquisite, full coverage engraving. Again, these are very nice guns. -A number of gun makers and gun retailers who traded under the Guyot name. -They spanned a timeframe from the last 19th to the mid 20th century. -They made some very nice guns. -They may have had some guns made by Francotte or by other makers in the Belgian trade. Do you know any more about them? Do you have one? Contact me and we’ll talk. « Forgeries in the gun world?? I have a N. Guyot scalloped boxlock with “12 Rue de Ponthieu Paris” marked on the rib. There really isn’t many other markings on the gun except “N. Guyot Paris” on the side of the action. The barrel flats have what looks to be a two identical Belgian proof marks, but I’m not positive about that! Not much on the action flats, but what I guess is a serial #. The trigger gaurd has what appears to be some sort of “Coat of Arms” or design of some type. Enjoyed your write up, but I’m still basically in the dark about my Guyot. It looks to have the intecepting sears and is not as ornately engraved as the one depicted in your write up. The breech balls are ornately engraved with oak leaf type engraving, and some light engraving around the outline of the action. I’ve tried to find out what I can about it, without much luck. I recently acquired a B guyot 20 ga side by side shotgun. This gun was left to me by my uncle. I believe it came from France when he was in WWII and brought it back with him. It appears to be in very good shape. It does not have the engraving like the one in the pics above. Can you tell me where I may find any information on this beautiful shotgun. I have a Guyot ca. about 1910-15. Boxlock, ornate engraving and gold initials on the forepiece. Said to have been acquired in India from British officer by State Dept. emissary. Nice shooting gun, but of course that old stock too short. Have to put on long pad to make it work right. I think M. Guyot perhaps stood for “miseiur” Guyot? I have a Guyot .25 ACP hammerless revolver that once belonged to Mrs. Leona Alderson, a “madam” in El Paso, Texas circa 1910-1920. I have a 16 guage Par N Guyot 12 Rukde Ponthieu, Paris shotgun it appears to be a custom made left handed gun with gold inlaided on safety and trigger guard. Do you know anything about it? I just picked up a guyot a lady who wants me to try to refinish or sell it for her. This is the 12 ga. side by side with hammers on top. lots of engraving all over this gun. One wierd side note on this one. it has the #1 all over it, under it , in it ,on it , on the stock. All the 1’s look identical, and from manufacturer. anyone have a thought on this #1 thing. seems three distinct evolutions to the nick guyot guns, originally c. 1883, was the hammer underlever, 12 rue ponthieu, secondly, c. 1900,appears the hammerless underlever, see james flynn, also marked 12 rue ponthieu and finally, c. 1912 thru 1930, appears the normal run of francotte-made,with whitworth barrels which exhibit the scallop, the oak leaf, the top lever, the belg. proof and the 18 rue ponthieu business address, some or all identifying marks on the same example…the purdey 7pin array and the meticulous lock up appear on the final evolution. this is my speculative opninion and would defer to james flynn as the only definitive authority, sparse as the field is. these final examples, 20 s and 30 s, are sleepers and may be twice the gun for the money. check out gunbroker.com today for two good examples. one, not discussed before is the sidelock hammer gun, toplever, and second is a dandy example of the scallop/scallop with acanthus leaf balls. mikeej is askin real money, but the pics are great, good discussion there also, as the pieces fall into place. great gun, bon chasse, . . steve. the barrels may have been proved off the actions if done outside england, and the belgian action flats may be proved and marked using a stock set of house barrels, or belgian barrels may have been proved off the action. actually . . . after,say, 1912, his barrels came from everywhere, and final assembly done anywhere, but its all good! a note to blaine above, aug.26, the belgian looking boxlock at olathe guns and on gunbroker looks to have the no. 2 all over it. bon chasse. action made buy Jay barels buy Jean Breuil. They are fine guns.But not well known. Have you ever seen any Guyot SxSs — either boxlocks or sidelocks? Have you ever seen any Guyot catalogs or other info on him?